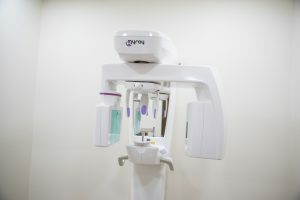 At our clinic, we utilize new state-of-art Technologies such as digital imaging, operating microscopes, ultrasonic instrumentation and cone beam computed tomography (CBCT). 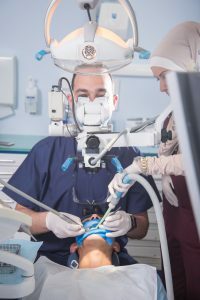 Advanced technologies, together with specialized techniques and training, give Dr.Hassan a very accurate view of the inside of the tooth, and allow them to treat the tooth quickly, efficiently and comfortably. A microscope can be a valuable resource to the endodontist performing your root canal. As a matter of fact, root canal specialists often use microscopes to find and treat all of the canals inside the tooth. The root canal procedure takes place in a very small area of the tooth and requires expert precision to effectively navigate the roots and canals. Some teeth may have more roots and canals than expected — missed canals can mean unresolved infections, which may eventually require another endodontic procedure, or even removal of the tooth. The use of advanced microscopy technology by a trained root canal specialist can help make your root canal treatment successful, allowing you to keep your natural tooth for a lifetime! Dental cone beam computed tomography (CT) is a special type of x-ray machine used in situations where regular dental or facial x-rays are not sufficient. It is not used routinely because the radiation exposure from this scanner is significantly more than regular dental x-rays. This type of CT scanner uses a special type of technology to generate three dimensional (3-D) images of dental structures, soft tissues, nerve paths and bone in the craniofacial region in a single scan. Images obtained with cone beam CT allow for more precise treatment planning. Finding canal orifices: In addition to length control, the biggest challenge facing the doctor is finding the canals, particularly in those cases where the orifice has become calcified secondary to restorative materials or a pulpotomy. You cannot perform a root canal unless you find the orifice. Ultrasonics are excellent for removing the secondary dentin that often slopes off the mesial wall. Ultrasonics also perform well when breaking through the calcification that covers the canal orifice. Removing posts and cores: Many of re-treatment cases will involve removal of a post. Dr.Hassan prefer to remove posts with an ultrasonic, because ultrasonics are a tremendous help in post removal. Removing silver points: Silver points were placed for many years, and we still re-treat many teeth that have silver points. Silver points are basically round, while most canals are somewhat oval. Consequently, leakage is a problem with a number of silver point cases, and flare-ups are more common than with regular gutta percha cases. The incidence of flare-ups is related to chronic leakage and corrosion products. The key point when removing silver points is to realize that silver is a very soft material. Any misdirection with a bur will sever the point, rendering the case more difficult. Ultrasonics are a huge help in removing these points. 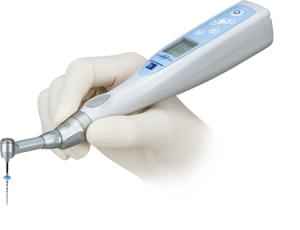 Rotary Instruments are used within the root canals and follow the dynamics of rotational motion. The use of Nickel Titanium rotary motorized files in root canal shaping and removal of old root canal fillings, enhances shaping ability of the canal, reduces clinical mishaps like blocks, ledges, transportation and perforation. 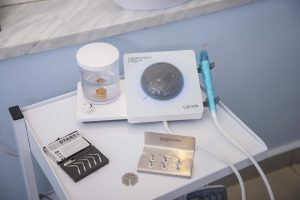 Using of these highly flexible files and motors make the root canal treatment more efficient and faster than the old hand filing technique, these files make of nickel titanium are much more flexible than the stainless steel files which have been used and are still used in many dental clinics. When Dr.Hassan uses Nickel Titanium rotary instruments, he avoids unpredictable file breakage, metal fatigue, loss of cutting efficiency, variation in length,diameter and curvature of the canal and helps him to achieve a better shaping of the canal.